Take a trip to storm country and try and fly off with a whirlwind full of coins in Tornado Farm Escape. Created by Net Entertainment and available to play on desktop, tablet and mobile devices, this 5 reel, 20 payline game comes with a pair of bonus features that can deliver mighty amounts of coins. Play from between 20p and £200 per spin. The concept here is certainly a little strange – picture a house and farm being blown away by a tornado and you’ll get the idea. Symbols include milking stools, wellies, radios, chairs, suitcases and flying hens, goats, pigs, horse and cows. 5 cows on a payline will get you a payout of 700 coins. The TV is the wild, appearing on all reels and replacing everything bar the hot and cold symbols. Tornado Farm Escape comes with 2 main extras – the Storm feature is triggered at random and sees a thundercloud float across the reels. Any symbols that are struck by lightning are then turned wild. A new payout is then made with the extra wilds in position. The Tornado feature doesn’t hit as regularly but offers more winning potential – to trigger it, you’ll need to land the hot symbol (red up arrow) on reel 1 and the cold symbol (blue down arrow) on reel 5. Whichever symbol is positioned in the middle of the reels will become the special chosen symbol – a tornado will then blow across the reels and hoover up any wilds and any of the chosen symbol and in the process deliver a cash prize. A re-spin will then follow. These re-spins keep on coming until there’s 1 that doesn’t include the randomly chosen symbol. If you’re lucky enough to land a high value animal as the chosen symbol, then some big payouts are possible. For example, if the tornado scoops up 15 or more cows during the re-spins you can look forward to a payout of some 1,200 coins. Better still is the wild – hoover up 15 or more of these for a 4,500 cashier boost. This is a strange little game – it’s well designed as always from NetEnt with the on screen action playing out to a catchy country and western style backing track. On the variance scale, we’d put it in the medium range. The lack of traditional free spins will be a disappointment to some but the tornado feature is a fine substitute. 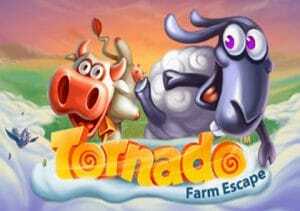 Tornado Farm Escape is a hit and miss affair but get lucky with the Tornado feature and this slot can blow up a storm as there are wins of up to 700 times your stake on offer. NetEnt has produced much better video slots with the high variance Dead or Alive always a great place to start.